There are about 7 members of the spruce family in North America, found throughout Canada and the northern United States. Spruces are evergreens, cone-shaped, broad at the base tapering to a point at the top. 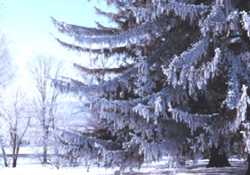 The wood of the spruce has a variety of commercial uses from pulpwood and flooring to Christmas trees. For home landscapers, varieties such as the Norway spruce and the blue spruce are popular choices with their beautiful foliage and striking shapes.